The polar vortex is at both poles. It weakens in the summer and strengthens in the winter. Whose summer and whose winter - aren't they reversed? I find that the Antarctic polar vortex is more pronounced and persistent than the Arctic one. Yikes! Chicago has renamed itself "Chiberia"
Chicago police say people are being robbed at gunpoint of their coats, especially Canada Goose jackets, which cost $1,100. Niagara Falls is a scene from the movie "Frozen" - the video coverage showed everything with a few inches of ice. Here's the story and Trump's tweet that says this HERE. The coldest place in the world will be Surgut Russia at -39.5 F then Yakutsk at -38.6F and Winnipeg follows at -38.2F. It's a race between Canada and Russia as to who will get the top medals for coldest in the world! The Canadian news is comparing Winnipeg's freezing cold temperatures with Mars. Winnipeg wins naturally. And the comparison with the west coast: Flowers are blooming in the west and snow is pummelling the east. West coast wins on that one! 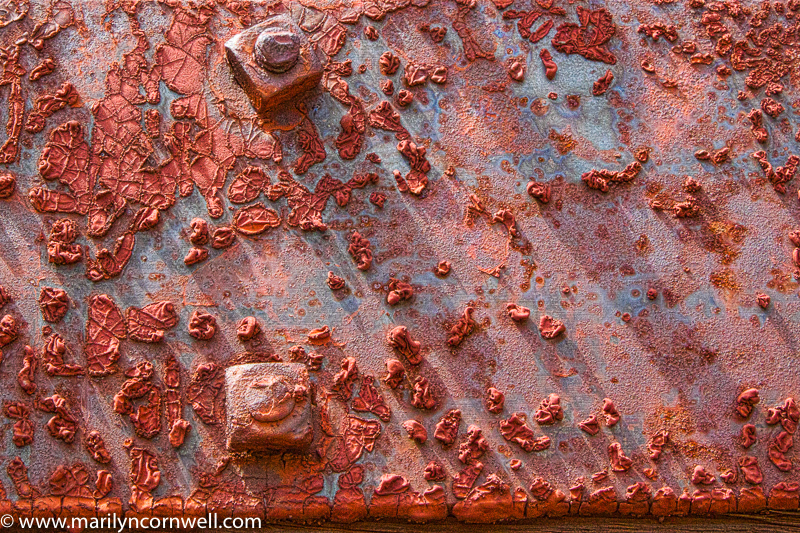 Today's images were chosen by a random number generator - the first is rust on a Silverton rail car, and the second a model at the Sundance Museum in Florida. They share the number 6534.